How to make Basic Tone Curve Adjustments for bird photography shows you how to use the tool and add some contrast to your bird photographs. Using the Tone Curve will help separate the bird from the background of the image too. 2 Processing Tips for Better Photos shows you how to use the Camera Calibration, Profiles, and Tone Curve in Lightroom Classic CC to improve your photos. A rather drab winter photo of a Pied-billed Grebe is changed from boring to beautiful in this short tutorial. This processing tutorial is an enhancement to my Quick and Efficient Workflow that I published earlier. Bird Photographers take a lot of images, here's how to sort through them and keep the good ones for processing. The new speed of Lightroom Classic and the use of embedded jpgs makes this part of the work flow faster. A workflow that’s quick, minimal and doesn’t take too much time. Since I try not to touch the sliders a second or third time, and since Adobe says it doesn’t matter what order we do things in here’s my current Workflow. This minimizes the amount of time I process images. There are other methods, ideas, and opinions and I am not saying this is the only way. I’m simply saying this is quick; it works for me, and since I get most of the image “right” in-camera I don’t need to make a bunch of corrections in Lightroom. Also, this is a basic version of my workflow there are many options in Lightroom I won’t cover them all. We're only going to talk about the Develop Module in this overview. A couple of tricks. 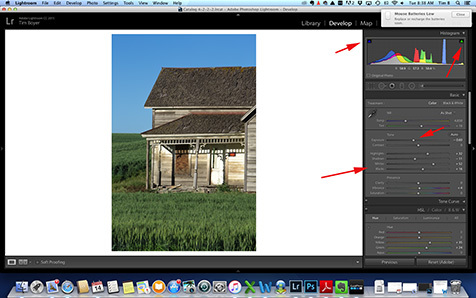 When I work on an image, I close the Navigation Panel on the left side of Lightroom. This creates more space for the image. I also make the Develop Panel on the right side wider, the wider the Develop Panel is, the most sensitive the sliders are, so it's possible to make a quick adjustment, and not over or under adjust. Okay let's get started, I start at the bottom of the Develop Module. Palouse wheat fields at the end of the day with low light filtered through the dusk of the day. The red arrow points to the Remove Color Aberration box to click. This type of image might have a line of Color Aberration since it's backlit. I click on the Profile tab and then on the Enable Profile Corrections. If my camera and the lens I was using doesn’t automatically show up, I pick the Make, Model, and Profile from the dropdown boxes. Click on the small arrows on the right of the boxes for these. There might not be any Color Aberration, but you’re already in this pane, and it won't hurt anything if there isn't any aberration. In some backlighting situations, there will be Color Aberration which will show up as a green, purple or red halo or line near the subject. Use this tap if you’ve taken an image with straight lines say of an abandoned building in the Palouse. Straighten the building by using the vertical and horizontal sliders. I do the Lens Corrections Panel adjustments first because if you Crop an image then get down to Lens Correction as one of the last things on your workflow, you’ll probably have to go back up and re-Crop. The second thing I do is sharpen the subject some using the Details Panel. Peregrine Falcon. By Masking out the blurred background I can touch up the Sharpening on hjust the bird. This method doesn't create anymore Luminance Noise in the background. Lightroom’s default sharpening is 25 I like to have things a little crisper so I often will push the sharpening to 50 rarely any more then that. By using the Masking Slider first though I can Mask out the background (if you’re using a normal bird photography trick of shooting wide open for a blurred and pleasing background this will almost always work.) Mask out the background by moving the slider to the right. When the background is black, and the subject is white you're done. The white part of the mask will get sharpened. This eliminates sharpening the background as a global adjustment. So if you’re shooting with a smaller sensor camera like the 7D Mark II, an APS-C sensor, this helps to eliminate or add any more Luminance Noise. One trick is to do the Sharpening at 1:1 so you can see what detail is being added, and don’t over sharpen and create artifacts, halos or make the image look to contrasty. Just after I Sharpen the image a little, I jump up to the Spot Removal Tool, located above the Basic Panel. I do this – mostly because I just used the Detail Sharpening Mask, and this too uses a similar masking. After you active the Tool by clicking on the icon, a Tool Bar will show up below the image. There's a checkbox for Visualize Spots, click on this, and use the slider next to it to see the spots by moving it right and left. More spots will appear as you move the slider to the right. You can also use this tool to clean up and unwanted "natural" spots on the images, like in this beach image some of the white highlights in the foreground. The Spot Removal Tool is active, and the lower tool bar has the slider. Since I’m up in the tools area above the Basic Panel, I use the Crop Tool now. I do this before I make and global adjustments using the Black, Whites, Shadows, or Highlights Sliders. I’ve found that sometimes if I make adjustments then crop I have to re-make the adjustments, so in the interest of only doing things once, I Crop first. I've Cropped this image to a "pano" type size 1:3, and Used the Angle Tool to straighten the horizon. There are several options here. If the image is well exposed and I got it right in-camera) I start with the Blacks Slider. If not, and I have an under exposed or over exposed image, I start with the Exposure Slider. I use this when the image is a stop or more under or over exposed. It’s a big global adjustment, so I use it sparingly. Just move the slider right and left until it looks like a good exposure on the image and the Histogram. I set the Black Point first. There are several ways to tell if you’ve gone too far in clipping the Blacks, Whites, etc. The first is the small triangles in the upper corners of the Histogram box (highlighted in the image below by the red arrow), they’ll light up with the colors being clipped. The another way is to hold down the Option or Alt key. This will show something that looks like a mask and indicates where the clipped areas are. I move the slider (Blacks, Whites, Shadows or Highlights) around until I have just barely clipped a tiny bit of data or not clipped any. Either of these two methods will work. Sometimes I just go by the triangles in the Histogram box because it’s one or two fewer keys to touch. Moving the Shadows slider darker will mean that you might have to redo the Blacks Slider. But it will also lighten under the wings of birds or bring out details in the shadows, which is what I do most often. Occasionally I will darken the shadows if that’s what is needed in the image. Same methods as before, but if the Whites Slider isn’t able to pull down any over exposure then try this first. If you have the sun in your image, let’s face it, you’re gonna clipped some data. But it won’t matter; everyone knows the sun is bright. For this image I adjusted the Exposure, and then adjusted the Black, Whites, Shadows and Hightlights. This is an abandoned house in the Palouse. Now there are times when there isn’t a definite Black or White Point in the image and pulling the exposure to the ends of the slider bar will make the image look weird. Don’t try to force the dynamic range, by adding Black and White Points that weren't in the original image. Use the Histogram as a guide to get the best exposure for the image, but look at the image, it sill might need to be adjusted. Maybe you have an image of a Bald Eagle, and the head is still very bright while the Histogram indicates it's not overexposed, but it looks like it is. Adjust for how you want the image to look. That's one of the creative decisions we get to make as artist/photographers. When I’m adding Vibrance or Saturation, I start with Vibrance since it will ‘saturate” the colors that aren’t overly saturated first. If this doesn’t give me what I need, then I use the more powerful, and global Saturation Slider. If you have people in your image, the Vibrance Slider won’t impact the facial coloration like the Saturation Slider does. See above, but sometimes I use both sliders to get the impact I want. I added Vibrance and Saturation to this image of the Pacific Ocean before sunrise in La Jolla. Since this effects a greater portion of the images, I do it before the most localized adjustments listed below. I use this to darken or lighten the sky or darken and lighten the foreground in landscape images. By using the Exposure Slider or the Blacks Slider in the drop down menu. Occasionally I will use one of the other adjustments available in this tool, Saturation, Noise Reduction, Highlights, etc. This image of a Palouse Sunset from Steptoe Butte, still have teh Graduated Filter Tool's mask showing. The darker the red mask, the more the exposure will be darken. I darkened the foreground to reduce the blue haze and create more impact in teh image. Before and after the Graduated Filter Adjsutment. With the latest version of Lightroom, there’s the Dehaze Filter at the bottom of the Effects Panel. I have been using this with the other global adjustments sometimes using it when I first start with the image – if it has a lot of haze or smoke, but sometimes I’ve used it just a little bit at the end after the Graduated Filter Tool. Smoke from last summers wildfire spilled over into the Palosue. The quickest way to correct for this(now) is the Dehaze Filter that comes iwtht eh new version of Lightroom. I use the Brush Tool to lighten or darken small areas that a global adjustment just would work on. The trick is to make the adjustment very light, don’t add too much darken and don’t add too much lightening. It works best as a subtle adjustment. To use this tool click on the Brush Tool, and then adjust the size of the brush, I typically use it with 100% Flow and Feathering. This helps to make the adjustment appear more natural. In this image, I adjusted the Exposure Slider a little bit. Brush in any other adjustments you need, a little spot might need some Noise Reduction, which is also one of the options. The"Pin" is visible from using the Brush Tool to adjust the dark volcanic rock of Haystack Rock on Cannon Beach. Often the last thing I will do to an image is to add a little saturation to the sky by using the Saturation Panel under HSL. This has a Target Adjustment Tool, just click on the tool then click on the color you want to saturate in the image. You can slide the mouse up and down to saturate or de-saturate until you get the look you want. The Palouse at sunrise from Steptoe Butte State Park. I lower the orange and increased the yellow in the sky with the HSL - Saturation Slider by using the Target Adjustment Tool. Summary of the Order of my adjustments. Basic Panel Local Adjustments -- Brush Tool, dodge & burn, and other options. HSL Panel - Adjust sky etc. I hope you find this useful; I keep trying to streamline my Workflow so I can spend more time creating images then post-processing them. All with the goal of being outdoors more then in front of the computer. Happy shooting!